Your first clue that a home inspection is important is that it can be used as a contingency in your purchase offer. 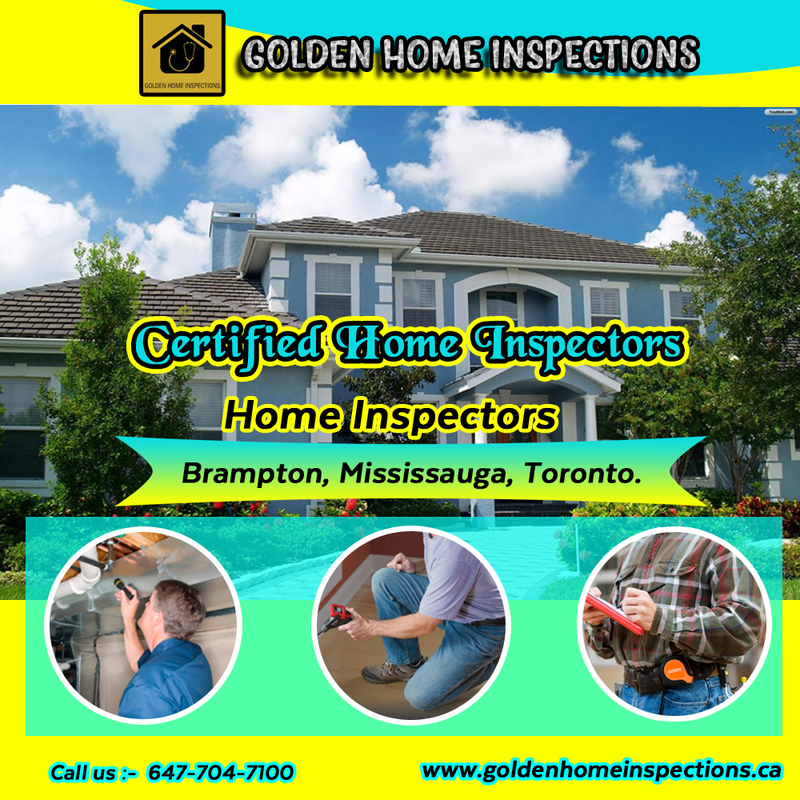 This contingency provides that if significant defects are revealed by a Home Inspector Brampton, you can back out of your offer, free of penalty, within a certain time frame. The potential problems a home can have must be pretty serious if they could allow you to walk away from such a significant contract. The inspector will check for damaged or missing siding, cracks and whether the soil is in excessively close contact with the bottom of the house, which can invite wood-destroying insects. However, the pest inspector, not the home inspector, will check for actual damage from these insects. The inspector will let you know which problems are cosmetic and which could be more serious. If the foundation is not visible, and it usually is not, the inspector will not be able to examine it directly, but they can check for secondary evidence of foundation issues, like cracks or settling. The inspector will test the garage door for proper opening and closing, check the garage framing if it is visible and determine if the garage is properly ventilated (to prevent accidental carbon monoxide poisoning). If the water heater is in the garage, the inspector will make sure it is installed high enough off the ground to minimize the risk of explosion from gasoline fumes mingling with the heater's flame. The inspector will check for areas where roof damage or poor installation could allow water to enter the home, such as loose, missing or improperly secured shingles and cracked or damaged mastic around vents. He or she will also check the condition of the gutters. The home inspector will check all faucets and showers, look for visible leaks, such as under sinks and test the water pressure. He or she will also identify the kind of pipes the house has if any pipes are visible. The inspector may recommend a secondary inspection if the pipes are old to determine if or when they might need to be replaced and how much the work would cost. The inspection will also identify the location of the home's main shutoff valve. The inspector will identify the kind of wiring the home has, test all the outlets and make sure there are functional ground fault circuit interrupters installed in areas like the bathrooms, kitchen, garage and outdoors. They will also check your electrical panel for any safety issues and check your electrical outlets to make sure they do not present a fire hazard. The inspector will look at your HVAC system to estimate the age of the furnace and air conditioner, determine if they function properly and recommend repairs or maintenance. An inspector can also give you an idea of the age of the home's ducting, whether it might have leaks if your home has sufficient insulation to minimize your energy bills and whether there is any asbestos insulation. The home inspector will identify the age of the heater and determine if it is properly installed and secured. The inspector will also let you know what kind of condition it is in and give you a general idea of how many years it has left. The inspector will sometimes check kitchen appliances that come with the home to make sure they work, but these are not always part of the inspection. Be sure to ask the inspector which appliances are not included so that you can check them yourself. The inspector will make sure the laundry room is properly vented. A poorly maintained dryer-exhaust system can be a serious fire hazard. If the home has an attached garage, the inspector will make sure the wall has the proper fire rating and that it hasn't been damaged in any way that would compromise its fire rating. They will also test the home's smoke detectors. The inspector will check for visible leaks, properly secured toilets, adequate ventilation and other issues. If the bathroom does not have a window and/or a ventilation fan, mold and mildew can become problems and moisture can warp wood cabinets over time. Inspectors vary in experience, ability, and thoroughness, but a good inspector should examine certain components of the home you want to purchase and then produce a report covering his or her findings. The typical inspection lasts two to three hours and you should be present for the inspection to get a firsthand explanation of the inspector's findings and, if necessary, ask questions. Also, any problems the Home Inspector Brampton uncovers will make more sense if you see them in person instead of relying solely on the snapshot photos in the report. 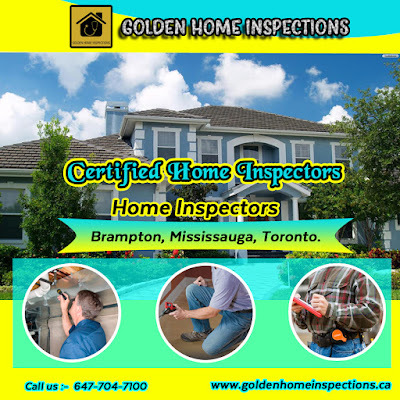 For more details to get an appointment from 10 years experiences home inspectors in the Golden home inspection.To click the website (WWW.goldenhomeinspections.ca) and book the appointment.